Consider that we have the given equation of a line, and this given line is perpendicular to another line which passes through the given point, and we must find the required equation of the line with the help of the given line. Now we follow the following procedure with the help of an example. Example: Find the equation of a straight line passing through the point and is perpendicular to another given line whose equation is . 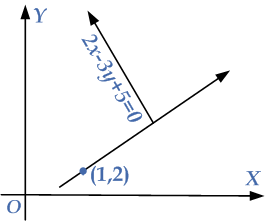 Compare this with the slope intercept form to find the slope of the given line . Now the slope of the given line is , since the given line is perpendicular to the required line under the condition of perpendicular lines . This is the equation of a straight line perpendicular to the line . In this calculated equation we observe that the coefficients of and cross each other with a negative sign between them.